75 years now, the Florist «Flower Design - Stelios' from generation to generation decorate with flowers, Flower arrangements, special constructions, business gifts and rare flowers, plants, the most beautiful moments of countless clients and friends, known and unknown, covering their needs and meeting the requirements for a personal or professional activity, creating relationships that stand the test of time. With raw material the flower, from the rarest to the most known and "wrap" our long tradition, we are close to you, with unique recommendations of flower and decoration, for unforgettable important moments of your life, at home, business or anywhere else you like. The flower-design.gr is a flower shop in Athens with a presence in the internet on line, flower markets. Our company called flower-design .gr is a modern and well organized florist in Athens. 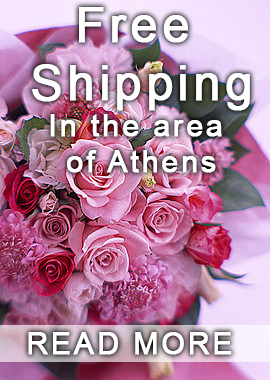 He deals with creating quality and original flower arrangements with fresh flowers that we receive daily from the Netherlands and distributed free of charge, their mission in Athens. Our goal is the total satisfaction of both our customers and recipients of gifts. Therefore we operate with professionalism and care so that we are able to satisfy the most demanding customer.